The styles in the fine arts from about the end of the sixteenth century to the first several decades of the eighteenth century is called baroque. Elements characteristic of baroque styles include extensive ornamentation, curved forms, and freely flowing lines, all in relatively large scale. The dress of the period clearly reflected these tendencies. Those who could afford to wear fashionable dress did so. The courts remained the most important stage on which to display opulent clothing. It has been said that Louis XIV (king of France from 1643 to 1715) used fashionable dress as a political tool, keeping his courtiers so busy following court etiquette and style that they had neither the funds nor the time to plot against him. 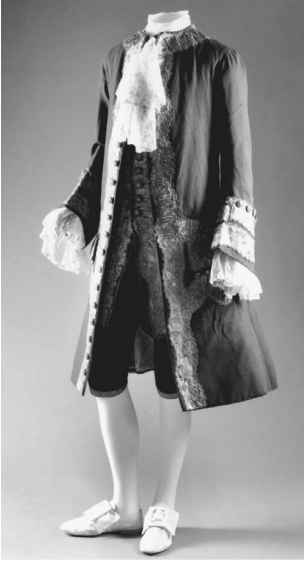 Eighteenth-century suit. During the reign of King Charles II, the three-piece suit, which consisted of knee breeches, a vest, and a jacket, became the standard dress for men. The Metropolitan Museum of Art, Purchase, Irene Lewisohn Bequest and Polaire Weissman Fund, 1996. (1996.117a-c) Photograph, all rights reserved, The Metropolitan Museum of Art. Reproduced by permisison. tion. The Puritans wanted to reform the Church of England and stress a simpler, more moralistic, and less lavish lifestyle. The resulting civil war led to the defeat and execution of King Charles I, after which a Commonwealth replaced the monarchy for about eighteen years. The Puritans dressed in more somber styles with little ornamentation. Their "Roundheads" nickname came from the short hairstyles they adopted. Portraits, inventories, and other written records show that although the Puritans stressed simplicity, their clothing followed fashionable lines. Among the affluent Puritans, high-quality, expensive fabrics were in use. The Pilgrims who settled in Massachusetts in 1620 were Puritans. The dress styles of the American colonists of the seventeenth and eighteenth centuries lagged behind those of Europe, but were otherwise the same. Only the trappers and explorers appear to have adapted some of the more practical elements of Native American dress such as moccasins; almost nothing made its way back across the Atlantic. Native Americans were depicted by portrait painters in garb usually containing European elements, whereas the dress of early American colonists is virtually indistinguishable from dress in Europe. By contrast, trade with the Far East had a significant impact on fashion. These influences can be seen in the fabrics imported from India, China, and Japan and in some specific garments. The vest adopted by Charles II of England is one example of Eastern influences. The prototype of the vest may have been Persian men's coats (Kuchta 1990). When the English monarchy was restored, Charles II (son of the executed Charles I) returned from exile in France under the protection of Louis XIV, and Puritan dress modifications were eclipsed by French influences and the court once again became the arbiter of style. One noteworthy item of dress adopted by King Charles II was the vest, the forerunner of what became a virtual uniform for men in the eighteenth century and later: the three-piece suit. Its seventeenth-century style consisted of knee-length breeches, a long, buttoned vest that reached just below the knee and covered the breeches, and a jacket of the same length over this. The Puritans were not the only seventeenth-century group to deviate from contemporary styles. The conservative nature of Spanish society was probably responsible for the preservation of older styles and a slower adoption of new ones. The wide-skirted farthingale of the sixteenth century disappeared in the rest of Europe in the early seventeenth century. Spanish upper-class women adopted this style in the mid-1600s. The Spanish guardinfante (literally, "infant guard") consisted of an oval farthingale, very wide from side to side, worn with a bodice that extended far below the waistline to cover the top of the skirt. As Reade noted, "Since exertion was difficult for anyone wearing it, the vogue emphasized social distinctions" (1951). Spanish men continued wearing the ruff and trunk hose longer than men elsewhere in Europe. By the eighteenth century, the Spanish dressed in mainstream fashion. permitted the formation of a guild of women tailors. Over time, using female dressmakers to make women's clothes and male tailors to make men's suits became customary. Some economists consider the economic changes that took place in England in the late seventeenth and eighteenth centuries a consumer revolution. Consumer interest in less costly imported cottons from India led businesses to stimulate demand for fashionable goods in order to increase their profits. To accomplish this, they needed to provide information about current fashions to potential customers. Engraved, sometimes hand-colored, pictures of the latest fashions were sold. Dolls dressed in the latest styles were circulated, and by the late eighteenth century, paper dolls showing current styles were also available. Styles were given names, and fashion terminology increased exponentially. As the demand for fashionable goods grew, more fibers, yarns, and fabrics were needed. Such requirements helped to fuel the industrial revolution and its mechanization of production. Consumer demand for cotton led to increased settlement in the colonies of the New World and to the use of slaves to cultivate and harvest the fiber. As supplies of cotton increased, invention of the cotton gin met the need to process more fiber. Inventors improved machines for spinning and weaving. Mass production of fabric made inexpensive fabrics available. As a result, by the end of the eighteenth century, following fashion was possible for all but the very poor and slaves. The name "rococo" has been assigned to the subtle changes in the art and dress styles of the period from about 1720 to 1770. Rococo styles are characterized by smaller scale but still curvilinear lines; more delicate ornamentation; and Asian, Gothic, and floral motifs. After 1770, the arts and architecture experienced a classical revival. These neoclassical influences came into clothing styles gradually and were accepted as the prevailing mode only toward the close of the century. The three-piece suit became the predominant component of men's clothing. Throughout the eighteenth century, men wore knee breeches, a vest, and an outer coat. When coat, vest, and breeches were made of the same fabric, the outfit was called a "ditto suit." The length of the vest, and the cut of both the vest and coat, varied over time. Early in the century, coats and vests were wide and full. When the coat was buttoned, it hid the vest. By midcentury, the coat was slimmer. So was the vest, which also shortened. The coat no longer buttoned shut, but remained open and the vest and breeches were visible. For formal wear, coats and vests were elaborately embroidered or made of very decorative fabric. A frock coat was looser and shorter than coats for more formal occasions. Early in the century, frock coats were worn in the country, but gradually they were also deemed proper for more formal wear. The silhouettes and the ornate woven, embroidered, or printed designs of the fabrics from which upper-class women's dresses were made in the 1700s reflected the curvilinear forms of baroque and rococo arts. The shape of skirts changed gradually. After the early eighteenth century, when loose, full sacque gowns were popular, the silhouette altered and bodices fitted the front of the body closely. Necklines were low, square, or round. In back some dresses were fitted, while others had full pleats at center back that opened into a loose, flowing skirt. Costume historians of the nineteenth century called this style a "Watteau back" after Jean-Antoine Watteau, an eighteenth-century artist, who frequently painted women in this style of dress. Skirts were held out by supporting hoops (called paniers in France) that were first cone-shaped, then dome-shaped, next narrow from front to back and wide from side-to-side. By the period from 1740 to 1760, skirts were enormously wide (as much as 2 % yards). Double doors helped to accommodate the passage of women in these panier-supported dresses, and small tables often had raised edges to prevent objects from being swept from them by a passing skirt. After the 1760s, paniers were replaced by cushions or pads worn at the hip, and the fullness of skirts moved toward the back. 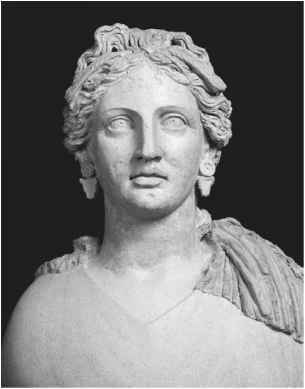 Hints of the classical revival in the arts could be seen in the dress of small girls, who wore high-waisted, slender white muslin dresses reminiscent of Greek Doric chitons. Women, too, began to wear white muslin dresses and moved away gradually from the full-skirted silhouette, but the adoption of styles closely modeled on Greek and Roman women's dresses came only after the French Revolution (1789-1795). What is the garment that historians consider to be forerunner of a man's threepiece suit? What did royalty wear in 18th century france men? How the rococo period influenced fashion in england? How did the Rococo fuel the revolutions?